But upon investigation, I’ve concluded that the ‘charge’ is correct. Jesus Christ, whom serious Christians believe is the son of God, did not make a blanket I-love-you statement about all of humanity. Does it make even a bit of sense that God would not want Jesus to love the world the way He does? Again, why would Jesus care about the kind of lives people are living if He didn’t love them? This passage refers to one of the basic tenets of Christianity, that Christ died on a Roman cross to make up for all the wrong things we’ve done and all the right things we’ve failed to do. Why would Jesus do this if he didn’t love humanity? Why? Why would he pray this if he wasn’t in complete union with what His Father wanted? His Father — who created you and me — wanted to take away the inevitable negative judgment on everyone who has “sinned” (and that means every person on this planet). Why would God — and by extension, Jesus — want to do this if He didn’t love me and YOU? Exactly. 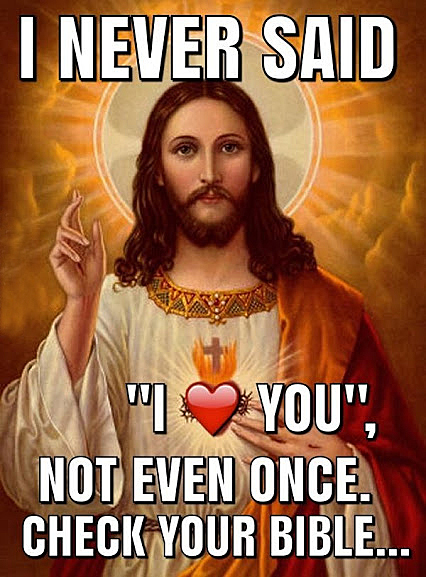 Jesus doesn’t say He loves me. Or you. He went further and proved it by his life, death and resurrection. And all this is offered as a gift to YOU. Are you interested in accepting it? Yes or no, post your thoughts below and let’s have a conversation. As the title suggests, actions speak louder than words. At work I am often told how much management cares and wants the workers to have the equipment they need etc… but then they don’t follow through with actions. It would mean WAY more if they didn’t say anything at all but provided the equipment. I would feel and know they care even without their words. I’ll start out by quoting the last verse in the gospel of John, which confirms that only a small portion of Jesus’ life was written down. Remember that the Bible only gives a condensed version of events. We therefore don’t know every word that He said to everyone while here on earth. John 21: 25 And there are also many other things that Jesus did, which if they were written one by one, I suppose that even the world itself could not contain the books that would be written. Amen. And then, before we go to verses that talk about Jesus loving people, let’s look at what Jesus had to say about love and how to measure it. John 15: 13 Greater love has no one than this, than to lay down one’s life for his friends. We see therefore, that even if Jesus had not said a word about love, His actions when He died on the cross for your sins and mine, said it all! However, there are some verses which you may find interesting. Jesus may not have said to many people that He loved them, but they knew very well that He did, by His actions. Here are some examples from the gospels. John 11: 5 Now Jesus loved Martha and her sister and Lazarus. John 13: 1 Now before the Feast of the Passover, when Jesus knew that His hour had come that He should depart from this world to the Father, having loved His own who were in the world, He loved them to the end. John 13: 23 Now there was leaning on Jesus’ bosom one of His disciples, whom Jesus loved. John 15: 12 This is My commandment, that you love one another as I have loved you. Finally, as the second Person of the Godhead, Jesus is not just loving, He is love. 1 John 4: 8 He who does not love does not know God, for God is love. I enjoyed reading this article, as always, Frank. I liked what the other posters wrote also. Good food for thought. Such love can only emit from God’s light and all that is good. That’s when you understand the joy of it all.